In other news: Car thefts are finally down—a little. 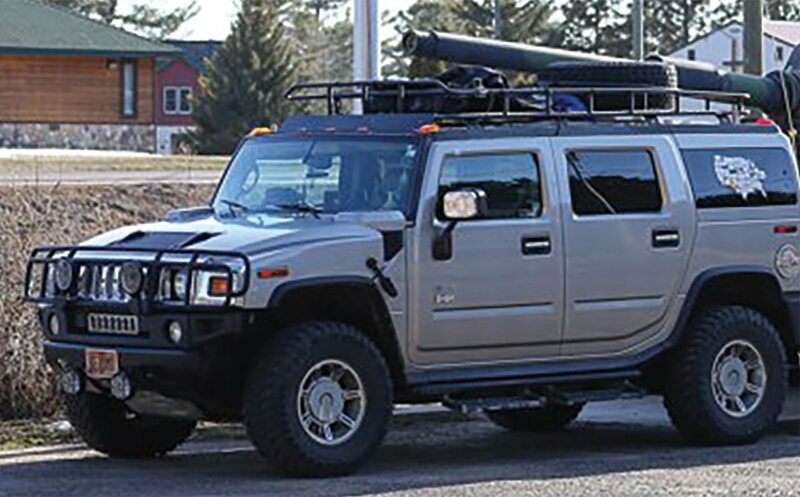 Lori and Bob Deveny’s Hummer. Deveny's Game Ensnares Terry Bean: Last week's WW cover story described the effects of Portland lawyer Lori Deveny allegedly stealing money from more than two dozen clients ("Game Over," WW, Jan. 16, 2019). Her conduct also indirectly put one prominent Portlander behind bars. LGBTQ pioneer Terry Bean was arraigned and taken into custody in Lane County on Jan. 17 on allegations he sexually abused a 15-year-old boy there in 2013. In 2015, Bean was arrested on the same charges. Deveny represented the alleged victim then, and according to a complaint the young man filed with the Oregon State Bar, she pocketed a $220,000 payment Bean made to the teenager. The teen's refusal to appear led to the original case being dismissed in September 2015. Now, the young man finally stands ready to tell the court what happened. "He always wanted to cooperate with the criminal justice system, and he still does," says the young man's new attorney, Sean Riddell. "He was the victim of very bad legal advice." Bean's attorney says his client is innocent. Portland Car Thefts Dip: The number of stolen cars in Portland dropped by 327 in 2018 after hitting a 20-year high the year before. There were 6,835 vehicles stolen in 2018. The Portland Police Bureau attributes the 4.6 percent decrease to aggressive enforcement in car-theft hot spots and increased prosecutions for repeat thieves. "DAs have really gone to bat and tried to prosecute the chronic offenders," says PPB spokesman Sgt. Stephen Yakots. "That's really what drives the numbers; it's the chronic offenders that steal multiple cars." WW found more than one-third of auto theft arrests between October 2016 and September 2017 involved repeat offenders ("Car Jack City," WW, Nov. 29, 2017). Multnomah County prosecutors changed their policies to crack down on suspects facing multiple charges in March 2018. The Oregon Legislature is considering a bill to close a loophole that has allowed chronic car thieves to evade conviction. Body Donation Bill Aids Embattled Company: In November 2017, the FBI raided the Northeast Portland headquarters of MedCure, a national company that solicits donations of newly dead bodies and then supplies body parts for medical research and training. No charges have been filed in that case, and the FBI declined to comment on the status of its investigation, which is reportedly part of a larger look at dubious practices by the industry. Meanwhile, Senate Bill 144 would allow MedCure to expand its business by enabling Oregonians to elect on their driver's licenses to make "whole-body" donations when they die. MedCure is currently the only nationally accredited body-donation organization operating in the state. MedCure's attorney, Jeffrey Edelson, didn't respond to a request for comment. Vancouver Anti-Vaxxers Spur a Measles Outbreak: Across the river in Vancouver, Wash., 22 children and one adult have caught the measles. The virus has been nearly eradicated in the U.S. since a vaccine was introduced in the 1960s. But a recent spike in people electing to forgo immunizations has made some communities vulnerable. In Clark County, only 76.5 percent of kindergarten students are up to date on all immunizations, and 6.3 percent cited a "personal exemption" to avoid at least one vaccine (84.5 percent had completed their measles immunizations). Although no Oregon measles cases have been linked to this outbreak, the state's declining vaccination rates mean the risk of spreading the virus in Portland is real. One infected patient attended a recent Portland Trail Blazers game, attended by 19,393 people.